Puntchesakut Lake Provincial Park comprises approximately 38 hectares of gently rolling aspen forest. 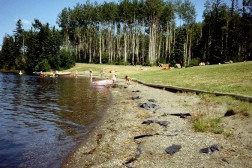 Located on the east side of Puntchesakut Lake, the park offers 1200 metres of waterfront, including a beautiful stretch of sandy beach and is easily accessible from Quesnel. Most recreation activities are lake oriented. Angling for trout in the spring and fall is perhaps the most popular pursuit, with anglers often catching trout up to 3 lb in size. Other activities include swimming, sunbathing, canoeing, boating, and water skiing. The park is also popular for picnicking. Hunting is not permitted in Puntchesakut Lake Provincial Park. Stay Safe: The park supports multiple lake-oriented activities. Please adopt safe boating procedures at all times, and be aware of canoeists, kayakers, and swimmers. There is no potable water available at this park and for the foreseeable future. We apologize for the inconvenience. The park is located approximately 40 km west of Quesnel. It can be accessed via Nazko Road (well-maintained and paved), and the trip takes approximately 25 minutes. For additional map information, please refer to topographical map numbers: 1:50,000 93B/15. Conservation: Puntchesakut Lake Provincial Park is located in the Interior Plateau, and is characterized by gently rolling terrain and attractive, almost pure aspen forest. The shoreline of willow and birch provides shade and cover for fish and other wildlife. Wildlife: The lake supports a wide variety of fish species, most notably, rocky mountain whitefish and rainbow trout. The rolling terrain in and surrounding the park is also home to moose and deer, with occasional porcupines, coyotes, and black bear. Cycling is permitted on roads and trails in the park. Bicycle helmets are mandatory in British Columbia. The lake supports a wide variety of fish species, most notably, rocky mountain whitefish and rainbow trout. When the lake freezes over, there are ice fishing opportunities in the winter. Anyone fishing or angling in British Columbia must have an appropriate licence. There is a swimming area roped off at this park. However, there are no lifeguards on duty at provincial parks. There are waterskiing opportunities on Puntchesakut Lake. There is no maximum boat motor size. The lake freezes over allowing for ice skating and ice fishing opportunities in the winter. When the lake freezes over, there are ice fishing opportunities in the winter. Anyone fishing or angling in British Columbia must have an appropriate licence. There is a concrete, single-wide boat launch located on the north side of the park entrance. There is parking available for vehicles/boat trailers. Firewood is not provided. Please bring your own if you must have a fire. To preserve vegetation and ground cover, please don’t gather firewood from the area around your campsite or elsewhere in the park. Dead wood is an important habitat element for many plants and animals and it adds organic matter to the soil. You can conserve firewood and air quality by keeping your campfire small. Limited burning hours or campfire bans may be implemented and some parks may use communal fire rings. Be prepared to bring a portable stove for cooking. There is a hand pump for water in this park located next to the picnic shelter. This park has a day-use/picnic area. There is a covered shelter with 4 tables and a wood stove as well as 2 change houses near the beach area. Fire pits and picnic tables are also located in the day-use area. This park has five pit toilets located throughout the park.